Shi of East & West, Qin Feng, Chinese, b. 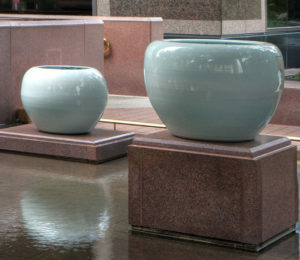 1961 2013, Marble and glass, Crow Museum of Asian Art. 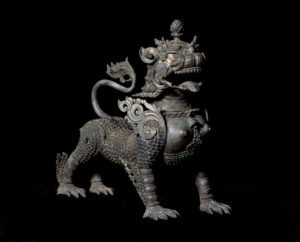 At the end of January 2019, the Trammell and Margaret Crow family announced the donation of the entire collection of the Trammell and Margaret Crow Museum of Asian Art along with $23 million to the University of Texas at Dallas for the creation of an Asian arts museum on that campus. 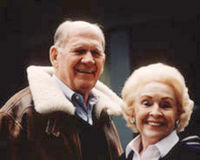 Mr. and Mrs. Trammell Crow, Wikimedia Commons. The words “Texas real estate developer” do not naturally bring to mind the image of someone that would say that the greatest element of success was “love,” who would fall in love with Asian art, and help to build a community of fellow admirers of Asian cultures in Dallas, Texas, but that was exactly the kind of man that Trammell Crow was and exactly what he did. From humble beginnings, Trammell Crow worked odd jobs through the Great Depression, and attended night school to earn an accounting degree from Southern Methodist University. During World War II, he audited the books of defense contractors for the Navy, then moved through a number of jobs until, at thirty-three, he became a warehouse real estate developer, and stayed in the profession for the rest of his life. He eventually founded the Trammell Crow Company, one of the largest developers in the United States, and whose success funded his decades of art collecting. 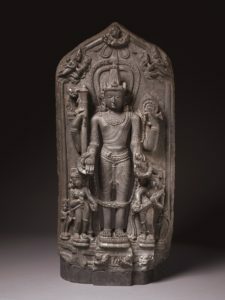 Stele with Vishnu Trivikrama, India, Bengal or Bihar, Pala period, 12th century, Chlorite, Crow Museum of Asian Art. Crow’s love of Asian art in particular has certainly accomplished much, as the magnificent collection that he and his wife Margaret built together. The Crows began buying Asian art in the mid 1960s. Over the years their collection grew to encompass more than eight thousand works from Cambodia, China, India, Indonesia, Japan, Korea, Myanmar, Nepal, Pakistan, Thailand, Tibet, and Vietnam as well as over twelve thousand books, catalogs, and journals. The artworks were frequently purchased from auction houses and private dealers outside of their country of origin, especially their Chinese artworks, due to strict Chinese export restrictions that prevented the Crow’s from purchasing works in China. 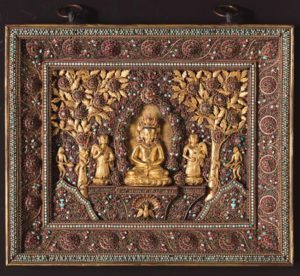 Temple plaque with seated Buddha, Nepal, Shah period, 19th century, Crow Museum of Asian Art. The museum has embraced an ambitious progressive mission, founded on a conviction that the arts are not an isolated or frivolous part of culture, but integral to our lives and our deepest selves. While in a narrow sense according to Abraham Carrillo, Director of Operations, the purpose of the museum is “to love and celebrate the arts and cultures of Asia,” its institutional goal is far broader: “To put compassion into action.” These values drive the museum’s educational work, through exhibitions, research, and public events such as lectures and workshops. The Crow hopes not just to provide access to a great collection but to encourage radical re-thinking of what Asian art is and where it comes from. “We define Asia as endlessly diverse, and not of one place, time, or idea. By cultivating compassion and inclusivity through our work, we build greater awareness and a shared sense of what it means to be human.” Their outlook deconstructs conventional assumptions about tradition, nationhood, and identity, attached to their historic art collection. Guardian lion. Nepal, Shah Dynasty (1768 – 2008), 18th century, Bronze, Crow Museum of Asian Art. In the video Our Asian Art Museum: Community Voices, on the museum website, members of the Asian community in Dallas reflect positively on the significance of the Crow Museum for them. Civilization-Landscape, Qin Feng, (Chinese, b. 1961) 2005, Crow Museum of Asian Art. By gifting their collection and a generous endowment to the University of Texas, Dallas, the Crow family have inaugurated a new, and perhaps even more exciting, chapter in the institution’s history. The gift of the Crow collection promises great benefits for the broader community, as well as the academic circles of the university itself. 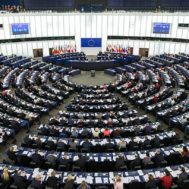 The money will be used to fund building of a second museum site on campus, ensuring easy student access to the collection, and allowing some of the 85% of the collection which has hitherto remained in storage, due to limited exhibition space, to be displayed. Having ready access to the Crow’s major collection of books and journals, as well as art objects, will empower students and faculty alike to pursue groundbreaking research in all areas of Asian art. At a time when many question the utility of the arts and humanities, and struggling high schools across America are cutting arts-related electives and after-school programs, the University of Texas, Dallas, is a standout for its dedication to the arts on campus. Only a few years ago, the Edith O’Donnell Institute of Art History was inaugurated, along with the Edith O’Donnell Arts and Technology building. A second on-campus museum is being planned to house the Barrett Collection of Swiss art, the largest now in the US, gifted to the university just last December. Now that the Crow collection has been added to their holdings, the University of Texas at Dallas seems ready to become a new nexus for the study of art and culture. 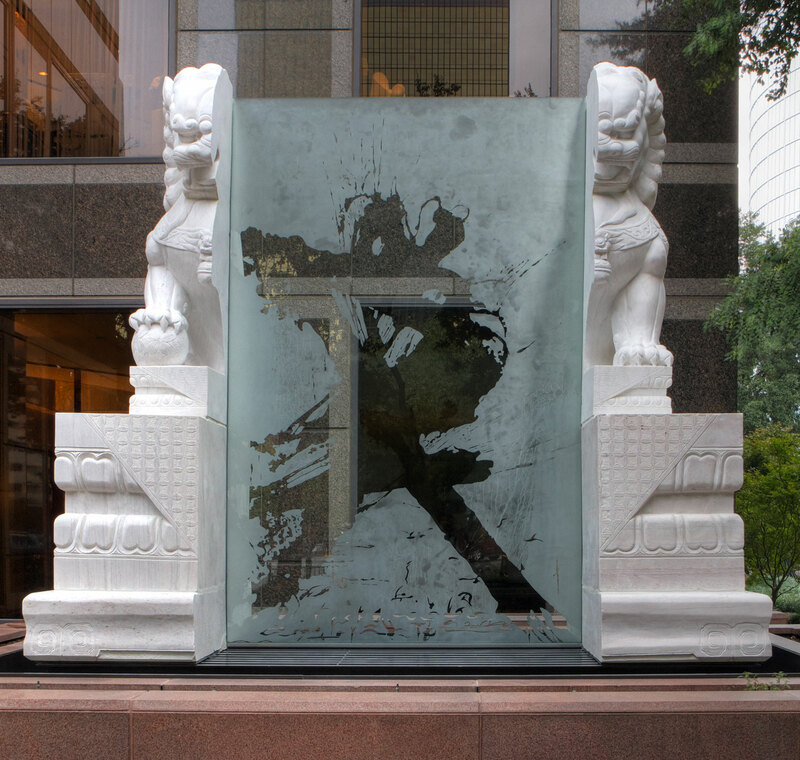 More importantly, their campus is now intimately tied to their local international and immigrant community, as well as a world-wide network of scholars, collectors, artists and audiences, all united by their love of Asian art.